By John F. McKenna (McJack): It was reported in the “Malaya Business Insight” that after signing a multi million dollar deal with Hewlett-Packard a month ago, WBO Welterweight Champion and Pound for Pound king Manny “Pacman” Pacquiao (53-3-2, 38 KO’s) is set to sign a more lucrative deal with the giant apparel company Nike. Pacquiao will be leaving in two weeks for Portland, Oregon to meet with Nike Chief Phil Knight and other top Nike executives to plan a marketing strategy for the promotion of “Pacman” product lines. The deal is similar to, if not richer than the pact Nike had with former NBA great Michael Jordan. Pacquiao’s wife Jinkee told “Malay Business Insight” that her husband will be travelling to the United States in the company of his Canadian adviser Michael Koncz. Meanwhile Manny Pacquiao’s promoter Bob Arum told the Examiner’s Michael Marley that the media tour to hype Manny’s November fight with Juan Manuel Marquez (52-5-1, 38 KO’s) in Las Vegas will be global. The tour will start in Manila then will be going to Singapore, where there is a huge interest in Pacquiao. The tour will also be going to Abu Dhabi in the Middle East and then head back to America. The tour will culminate, appropriately enough in Mexico City. Pacquiao is set to grace the cover of the inaugural issue of “Fight Life”, a boxing magazine which will hit newsstands soon. Manny has also appeared on the cover of the prestigious Time Magazine. Manny will be in the company of acclaimed television and movie star Ron Periman of the famed “Sons of Anarchy”. The two met at Freddie Roach’s Wild Card Gym in Hollywood and have become close friends. It has become increasing clear that Manny Pacquiao has become a world wide celebrity and that he has transcended boxing. He accomplished this by not only being a great fighter, but by also being a good will ambassador for the sport that he loves so much. 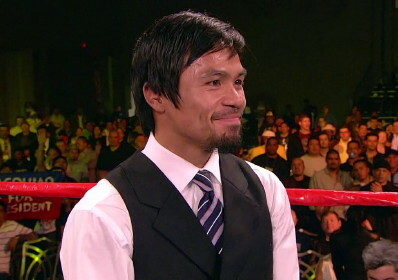 Through it all Manny has never forgotten where he came from and has worked hard to help his people in the Philippines. « Saul Alvarez vs. Ryan Rhodes: Can a mistake lead to defeat?